We are happy to post this guest blog from Meghan Clark, an assistant professor of theology and religious studies at St. John’s University. A longer version originally appeared on the blog Catholic Moral Theology. The choice of Paul Ryan as the GOP Vice-Presidential Nominee has moved Catholic social teaching once again to the forefront of public debate. One of the most common refrains I hear in these discussions is the justification for cutting social programs like SNAP using John Paul II’s caution against the social assistance state in Centesimus Annus. The assumption is that the United States of America is or is approaching becoming the social assistance or welfare state. As a Catholic moral theologian, it is wonderful to be debating the principles of CST in the public square, and even in the pages of the Wall Street Journal. However, as we debate the principles that guide a Catholic ethics of poverty, social justice, government, and the common good, we must abide by two firm rules. First, it is imperative that we get the basic principles of Catholic social teaching correct (I have tried to do this elsewhere on the principle of subsidiarity). Second, it is crucial that we engage contemporary reality as it exists, and this involves not only the contemporary context but concrete evidence. John Paul II acknowledges the positive role of government, places national government in relationship to local and intermediary levels of government, and the necessary limits of government action with regards to the full dignity of the human person and the common good. Let me be as clear – the primary concern for John Paul II is the dignity of the human person and the fullness of the common good (which includes but is not limited to the public order role of government). This concern is different from the primary concern among many GOP discussions – which is either purely economic or a mix of economic with individual liberty sprinkled on top. The measure of the social assistance state for Catholic social teaching is not merely a matter of labor participation (the question of at what level taxation and social assistance becomes a genuine disincentive to work) but about the flourishing of civil society. John Paul II is concerned with government intervention paralleling communism where the government takes over the functions of all other levels of society and eroding any personal sense of responsibility for our neighbor. To be as blunt as possible—we simply don’t have that generous of a social protection safety net. In addition, since 1996’s welfare reform the actual assistance available to children living in poverty has SHRUNK. In 1996, for every 100 poor families with children, 68 received cash assistance – as the graph above notes, today that is only 27. According to data at the Center for Budget Policy and Priorities four part series on Hardship in America (November 2011), TANF benefits have fallen by 20% in 34 states since 1996 when adjusted for inflation. To claim that the United States of America is remotely approaching the social assistance state simply distorts the reality of the American safety net—it just isn’t that strong, generous or comprehensive. Just ask anyone who’s ever been on public assistance or lived at or near the poverty line. To quote economist Charles Clark (who also happens to my father and has written on the need for evidence-based economics in Commonweal), prudential judgment in CST requires evidence based reasoning and the evidence is clear: if you want to reduce poverty we need to enhance not erode or reduce social protection. The questions of the social assistance state are complicated and it is difficult to envision the perfect equilibrium. But, according to OECD Better Life index, the United States has higher rates of volunteering and greater time spent per day in volunteer activities than OECD average. I highly recommend taking a look at all the categories and data (the health info is particularly interesting); however, if a primary concern is development of a sense of responsibility for the stranger in terms of volunteering or one who crosses one’s path—Americans fair fairly well against their peers. Now, if one wishes to have a serious conversation about the social assistance state—in light of CA—then we should be talking about those countries that appear to have little or no volunteering. Now, I am not attacking the social welfare systems of France or Spain or even Norway (as I do not know enough about the data for such countries); however, if we are going to have a serious conversation about the cautions in Centesimus Annus, it appears to me that is a far more appropriate starting point. However, I will also caution that in all of these conversations basic justice must be achieved before we can properly talk about leaving room for individual charity. Paragraph 48 of CA is vague and often gets pulled out as the proof text for those who wish to reduce the size and scope of government placing more trust in the market itself. I am well aware that in the coming months the Catholic community will have a vibrant and robust debate concerning a multitude of political issues—including the status of poverty programs in the budget. There is much room for creative thinking, differences of prudential judgment, and investigation into the rich themes of Catholic social teaching. Into this debate, let us be guided by the evidence and the reality that whatever else we may be, we are not the social assistance welfare state. What seems to be in dispute is whether or not the poor "deserve" to be helped. We are so close to the heresy that salvation is somehow "earned" by our good efforts. No one makes any allowance for the misfortune that befalls people, especially children, through absolutely no fault of their own. 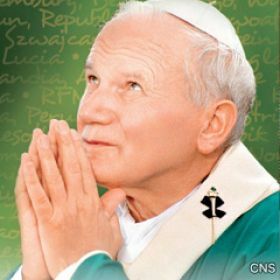 JPII's characterization of a so-called "social assistance welfare state" is on its own a terrible distortion of the gospel teaching to love your neighbor. We are debating angels on the head of a pin again, much to the contempt and ridicule of honest and pious folk all over the world. It is a wonder that any beggar would approach any of us for help; but they are so desperate, they will and do swallow all pride and suffer debasement just to survive another day. Next, we will be showering praises upon the dumpster divers of Rio to show how those good Catholic beggars have pluck. How will we fare before the Lord at Judgment Day? Food stamps, welfare, and the like, which have so grown and prospered under our current administration, as needed as they are, are intended as helping hands, as way stations, not as handouts to support a life style. But until we have an administration in place that can effectively deal with our current troubled circumstances, all of us need to step up. In that regard, if we could only have our populous and comparatively wealthy East and West coast citizens be as generous with their charitable donations of time and money as the rest of the country, we could go a long way to alleviating the needs of those currently suffering in this extended economic downturn. It might be a reality check for her and others. People think there is an infinite supply of goods to give away. There isn't and it is OP's like this that show the naivete of many who have good intentions. Modern governments are impossibly complicated juggling machines, morally, ethically, economically, fiscally, socially, legally. You can't please everybody, but you try to do so, while keeping your eye on the balls of survival, fairness, justice, material progress, psychological sanity, honesty, transparency, and international relations of many sorts. Strategic compromises are absolutely necessary to keep the machine from breaking down. The game really is not simply about caring for the poor and the unhealthy, extremely important as those things are. That said, when one or two elements of the economy are of paramount importance to someone, it behooves that person to speak out strongly, as Ms. Clark does here. Excellent. John Paul II acknowledges the positive role of government, places national government in relationship to local and intermediary levels of government, and the necessary limits of government action with regards to the full dignity of the human person and the common good. Let me be as clear – the primary concern for John Paul II is the dignity of the human person and the fullness of the common good (which includes but is not limited to the public order role of government). This concern is different from the primary concern among many GOP discussions – which is either purely economic or a mix of economic with individual liberty sprinkled on top. It's missing from many Democratic discussions, too. And that's probably not a bad thing. You really do not want politicians to be moralists - they're simply not cut out for that. They're practical people, people who work with the possible, not the ideal, and their tools are laws and regulations, not sermons. Trying to mix politics and religion, politics and morality, is trying to mix oil and water. It doesn't work and it makes a mess. I suggest that writers on American politics stop quoting their favorite encyclicals and papal allocutions. It is easy to pick those you like and ignore those you dislike. In any event, they have to be judged on their merits, which may or may not be significant. I have not noticed many writers here bolstering their arguments with quotes from Quanta Cura or Humanae Vitae.